The history of Millinet Solar is synonymous with the history of the Korean solar photovoltaic (PV) industry. Millinet Solar, the first multi-crystalline solar cell manufacturer in Korea, currently operates a 300MW-capacity line and will increase its capacity by 300MW by this August. Established in 2005, the company has seen spectacular growth. Its sales surged to 150 billion won in 2010. The company set up its foundation at the Seongseo Industrial Complex in Daegu and completed its solar cell factory in 2007. Since 2008, Millinet Solar has exported the world’s top quality solar cells primarily to Europe. Millinet Solar has been constantly making efforts to make its products world top-class and the company is aiming to establish its second factory to achieve the goal of 1GW of annual solar cell production as well as 1.7 trillion won in annual sales in 2013. The company has come from strength to strength to become a representative Korean green company through the vertical integration of the solar energy industry and also by moving forward to establish a PV module factory in California and a solar wafer factory in Paju, Gyeonggi Province. Millinet Solar has been striving to develop PV technologies to dominate the global market by ensuring source technologies with its R&D staff in its solar cell institute. The company has built an industry-university cooperative system with Yeungnam University, the Korea Institute of Science and Technology and others as well as secured new solar cell technologies with the cooperation of national think tanks. It has been working on improving the efficiency of the mass production of solar cells through the application of R&D. 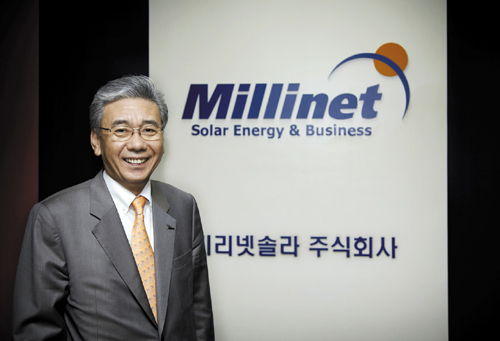 Millinet Solar was presented with the $50 million export tower and Chairman Lee Sang-chul won the 2010 Trade Businesspeople of the Year Award at the 2010 Trade Day award ceremony in Seoul last Dec. 7. The company was credited with exporting $100 million in 2010, a 2.4-fold surge over the previous year, by establishing the nation’s first high-quality solar cell product line and focusing on making forays into Spain, Italy, Germany and other Southern European markets. Lee also received the Month of Trade Businessman with International Fame award from the Korea International Trade Association last October. At that time, Millinet Solar was praised for spearheading the exploration of new global markets. It succeeded in entering the Spanish solar cell market by exporting its goods to Spain’s top four solar energy companies in 2010 following its entry into the Italian market in 2008. Millinet Solar has exported solar cells, assessed to be more efficient and more excellent in safety and durability compared to its Chinese counterparts, to 20 countries including Germany, Spain and Italy, the European countries in widespread use of solar cells, as well as Asian countries including India, China and Hong Kong. Millinet Solar is considered a role model among environment-friendly enterprises because it succeeded in mass-producing multi-crystalline solar cells with an efficiency rate of 17 percent via its own manufacturing method last April. The company is striving to become a global front-runner in the global solar PV industry. “Millinet Solar joined the 100-billion won sales club last September, and 2010 sales surpassed 150 billion won. We earned $130 million in foreign currencies from abroad, accounting for 95 percent of total sales,” he said. As part of its efforts to expand production facilities, which began late last year, Millinet Solar will complete a 100MW solar cell production capacity expansion by March and another 200MW expansion by August, Lee said. “If the expansion goes as planned, we aim to post 355 billion won in sales, exports of $250 million and approximately 30 billion won in operating profits during this year,” he said. As to reductions in feed-in tariffs that will have a negative impact on the German, French and other European markets, Chairman Lee said the United States, in which projects to build solar PV facilities with a combined capacity of 6.5GW are in the offing, is likely to emerge as Millinet Solar’s next major exporting country to replace Germany. China, Japan and other Asian markets as well as North American markets are predicted to maintain explosive growth with an annual increase rate of 50 percent thanks to recent strong government strategies to nurture the PV industry, he said. Major global market survey firms predicted that the epicenter of the global PV market will move from Europe to Asia and North America starting this year, he added. Lee stressed that N Solar, the U.S. subsidiary of Millinet Solar, will serve as a solid foundation to gain a foothold in the North American markets, adding that the module manufacturing plant N Solar is building in California, scheduled for completion in the first half of this year, is to mass produce solar cells in the second half. N Solar plans to expand solar module production capacity from 100MW in 2011 to 500MW in 2013 as the size of the North American market is forecast to see a 10-fold jump in the next five years. The chairman noted that Millinet Solar is also keeping an eye on the North European region, including Finland, which has seen green energy supply rise to a range of 30 percent, based on predictions on a surge in PV demand. As part of efforts to diversify its business portfolios, he said, Millinet Solar is working on the vertical integration of all segments of the solar PV industry ranging from raw materials ― solar ingot/wafer to solar cells, modules and systems. Speaking specifically, Millinet, a subsidiary of Millinet Solar, which has entered the solar PV system segment, is striving to work on the development of solar PV application products, including the construction of solar PV power plants, inverters and solar trees. In particular, he said, the company last November finished the 400kW-class solar PV power plant project in the Gangneung reception station site it landed from KT Corp. last August. (up) Millinet Solar Chairman Lee signs an MOU for solar business cooperation with Sacramento, California in which N Solar has invested at McClellan Business Park. Lee receives the 2010 Trade Businesspeople of the Year Award from Korea International Trade Association Chairman Sakong Il. A front view of Millinet Solar’s first solar cell manufacturing plant in Daegu.